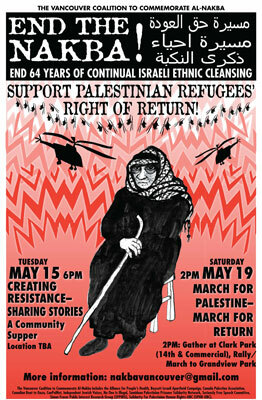 On the 64th anniversary of the occupation of Palestine, and as the Palestinian people enter the 64th year of dispossession and exile, the Vancouver Coalition to Commemorate Al-Nakba is organizing 2 events to commemorate the Nakba, stand against the continuing Nakba, and call for the right of return for Palestinian refugees and freedom for Palestine. 64 years after the Nakba – the war of 1948 in which over 800,000 Palestinians were driven from their homes and land and the state of Israel created on that land – Palestinians continue to struggle for their right to return, for freedom from occupation, for justice, and against the Nakba that continues today. Save the date now and plan to be part of these 2 important events! This community supper will bring together the community to share stories, creative work, and discussions about indigenous resistance, continuing Nakba, and struggles for freedom. The program will include talks by Palestinian and Indigenous activists and community members, Palestinian music, and a short film by Palestinian director Sobhi al-Zobaidi. Childcare is available. We request RSVPs for attendance, and for childcare, to nakbavancouver@gmail.com in order to ensure we have enough food! No one will be turned away. March and rally commemorating the Nakba, standing against the continuing Nakba, calling for justice, freedom and return for Palestine! We will also stand against Canada’s complicity and its own genocide of indigenous people. Creative actions welcome! This is a family friendly march. The Vancouver Coalition to Commemorate Al-Nakba includes the Alliance for People’s Health, Arab Students Association – UBC, Boycott Israeli Apartheid Campaign, Canada Palestine Association, CPSHR – Canada-Philippines Solidarity for Human Rights, Canadian Boat to Gaza, CanPalNet, Canadian Union of Postal Workers, Independent Jewish Voices, No One Is Illegal – Vancouver Unceded Coast Salish Territories, RAGA (Race, Autobiography, Gender & Age Studies) Centre at UBC, Samidoun Palestinian Prisoner Solidarity Network, Seriously Free Speech Committee, Simon Fraser Public Interest Research Group (SFPIRG), Solidarity For Palestinian Human Rights-UBC (SPHR-UBC), SANSAD – South Asian Network for Secularism and Democracy, Stopwar.ca. To join the coalition or for more information please contact nakbavancouver@gmail.com.To join the coalition or for more information please contact nakbavancouver@gmail.com.